Showcasing its continued strength and leadership in enterprise-capacity storage solutions, Western Digital announced the industry’s highest capacity HDD, the 15TB Ultrastar DC HC620 host-managed SMR HDD. The Ultrastar DC HC620 delivers an unprecedented capacity point with a time-to-market advantage for customers who have invested in, and continue to take advantage of the benefits of SMR. Setting a new bar for TCO, the Ultrastar 15TB host-managed SMR HDD is well positioned for hyperscale cloud and traditional data center workloads, including large video surveillance “smart city” initiatives, storage for regulatory compliance and Big Data storage. Enabling the world’s densest server and storage systems, incorporating 15TB HDDs allows a fully populated 4U60 HDD enclosure to reach a raw storage capacity of 900TB, which is an additional 60TB per 4U rack in the same footprint compared to those utilizing 14TB HDDs. In an at-scale environment where floor space, $/TB, TB per square foot, or watts per terabyte are critical, this TCO savings can be significant. Based on the company’s proven HelioSeal platform, and as an extension to the industry’s first 14TB SMR HDD family, the 15TB enterprise-class Ultrastar DC HC620 host-managed SMR HDD reflects another industry first, continuing the company’s tradition of delivering the highest capacity enterprise-class HDDs in the market. Western Digital is currently shipping Ultrastar DC HC620 qualification samples to select customers with broader availability later this quarter. 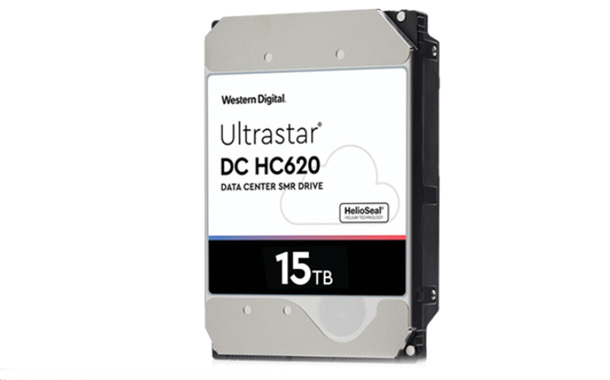 The new Ultrastar DC HC620 HDD further expands Western Digital’s broad range of enterprise-class storage solutions, which include high-performance NVMe SSD devices, innovative HelioSeal enterprise-class hard disk drives as well as SAS and SATA SSDs. The company’s data center systems include its ActiveScale, IntelliFlash, OpenFlex, and Ultrastar storage servers and platforms.